Fundraising is the process of gathering voluntary contributions of money or other resources, by requesting donations from individuals, businesses, charitable foundations, or governmental agencies. Traditionally, it consisted mostly of asking for donations on the street or at people's doors, and this is experiencing very strong growth in the form of face-to-face fundraising, but new forms of fundraising, such as online fundraising, have emerged in recent years, though these are often based on older methods such as grassroots fundraising. Another social event and lots more. Women spend an average of about $15000 a year on makeup while Men were revealed to spend $13500 on an average per year. The revenue of the U.S. cosmetic industry is estimated to amount to about 62.46 billion U.S. dollars in 2016. How much Money celebrities spend on make-up? Click Here to know the figures. 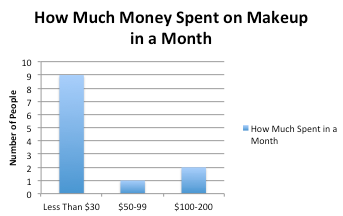 So, everyone can easily understand that how much money is spent every day on make-up all over the world. What if we celebrate a day without make-up (NO MAKE-UP DAY) on April 25 every year and donate the money saved to a charity.I believe the amount of fund raised by this campaign will be a lot if it is successful.